They say that accessories make an outfit. Jewellery in particular can bring class, elegance, and a little something extra to help complete a look. You can make your own jewellery whether classic, simple pieces are your thing, or brighten up an outfit if you prefer loud, vibrant costume jewellery. Making your own jewellery means that you can create your own exclusive and bespoke pieces. You may have a favourite gemstone that you'd like to craft into something unique, or you may have fixation with rings or pendants that you could indulge. The range of materials and tools available means that jewellery making is accessible by anyone that wants to try it. If you have a friend that loves jewellery, rather than heading to your local jeweller, you could also fashion something a customised piece for them. A personalised piece can become something that they truly treasure. The wonderful thing about handmade jewellery is that more often than not carefully crafted, but has had a lot of thought and effort put into the customised design, making it a perfect gift. 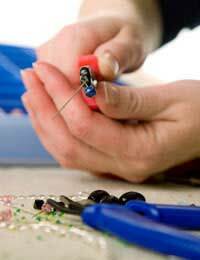 If you've never tried making your own jewellery before, there a few easy ways to get started. Of course, there are a multitude of ways to start making your own jewellery. It's really not worth investing a huge amount of money in materials and equipment until you know that you're quite serious about jewellery making as a hobby. Some techniques require specialist tools, especially when working with materials such as metal or precious stones. If you want to go in this crafting direction, your best bet is to sign up with a practical beginner's course and learn from an experienced hand. One of the simplest ways to get acquainted with jewellery making is to start with beads. Beads are also one of the cheaper options, particularly if you start working with seed (small) beads. Beaded bracelets are a great starting point for any jewellery-making novice. Working with different sized and coloured beads will also allow you to explore your design skills and techniques. If, for instance, you decide to string a necklace together, you'll need to choose your throng material, the type of fastening, and explore the way different beads work together. Small craft shops and haberdashery counters will have many varieties of beads available, such as small coloured plastic beads, cat-eye or tumble chip beads, metal, porcelain or wooden beads as well as bugle beads and large glass specimens perfect for pendants. An environmentally friendly and frugal alternative to buying new materials is do a spot of thrifty shopping. Why not try raiding charity shops, or rake through tabletop, car boot or jumble sales for some old unique pieces. You can find old costume jewellery or vintage pieces as great prices, and give them a new lease of life. Although you may still have to incur the cost of items such as brooch mounts or new fittings, you will still be saving money and partaking in some very creative recycling. Be careful though, you may find this hobby quite addictive once you've started!